Hi SE Readers. Joan here today. Several years ago, when my friend and I first started a writer’s group in our hometown, she approached a local author who had been traditionally published and asked if she would be willing to speak to our group. Most of us were new to the game and none of us had been published. We were eager to learn all we could about the writing and publishing world. The author’s reply? As you can imagine, we were taken aback. I vowed then that if I ever became a published author, I would do what I could to encourage new writers. For that reason, I try to have encouraging posts here on Story Empire. Warning: today’s post may seem a bit discouraging but bear with me. There is probably not a writer among us that wouldn’t like to be the next J. K. Rowling, Stephen King, or John Gresham. Who wouldn’t want to be on the NYT best seller list time and again, be able to quit their day job, and make a living doing what we love? Success stories in the publishing world are few and far between. We are fortunate to live in a time when the opportunity to become a writer is better than ever thanks to self-publishing. But with that opportunity comes the fact that the market is flooded. Tens of thousands of writers are competing for an audience. So what is a writer to do? Give up, throw in the towel, or keep writing? This is been a tough year for me. Changes at my job, along with a few health issues, have interfered with my writing. The novel I began writing in January (and hoped to publish in October) still isn’t finished. When I got to what I refer to the “messy middle” I almost wanted to give up. But I can’t. Instead of struggling, I put aside the novel for a couple of days and wrote a short story, the idea of which I toyed with for months. It’s a mindless piece of fluff that I will never publish. I will never make a single penny off it, but I had to get the story out of my head and into the computer. Clearing the idea from my brain helped the creative process. I was able to go back to the novel with a fresh perspective. I plowed through the middle and the end is now in sight. Recently, the a few of the Story Empire authors and I talked about writing for money. We agreed while it would be nice to make a living with our words. But money or not, we’ll keep on writing. That inner voice and the desire to write is stronger than the desire to become wealthy. Writing is something we do. It’s something we must do. So if you’re down and discouraged, take time to think about why you got into this business in the first place. Was it to make money? Or was it for the love of writing? ← Friday Writing Question: Can You Still Learn? It is true what you have said here but isn’t it great when you get a book with your name on it in your hands. Thank you for your honesty, Joan. I SO relate to this post. I think all of us would love to be able to make a living writing, but as you say, the market is flooded and the probability of that is slim to none. But, like you, I am compelled to keep moving forward. I got another rejection on my fiction series last week and it set me back again mentally and put me in a funk. I’ll probably just give up eventually, on finding a publisher and publish them myself as I did my other five books. But, in the meantime, I keep writing. Because it’s a part of me. Oh, Jan. I’m sorry about the rejection. They hurt. Glad to know you plan to keep writing regardless. And who knows? Maybe one (or some) of us will have that financial breakthrough some day! I’m delighted you channeled your energy into a short story. Cheers to you, and thank you for sharing this timely piece. I used to take a lot of photographs. Although I’m far from being a professional, I balanced it with writing. I wish I knew more about graphic design, I applaud those that do. Hope you’re able to write again soon. Writing for me is an addiction that screams to be fed, and when the muse falls silent the withdrawal is horrendous with no ‘rehab’ in sight. I’ve been trapped within my damaged shell for years now. But when I write … I can run free. I can fly with the eagles and walk with the turkeys. Crazy? Oh, yes … we’re writers … that comes with the territory. Thanks for the post, Joan. I love that line: “I can fly with the eagles and walk with the turkeys.” Thanks so much for weighing in, Soooz! My pleasure! I enjoyed the post! Thanks for the great reminder, Joan. I think we all hit those road bumps and down times of becoming discouraged. Whether it’s because we can’t seem to see our way clear of a “messy middle” (I’m struggling with that right now) or because we work so hard and make so little, it takes tenacity to keep going. More than that, it takes being in love with writing. Like you, and many others, I am in it for the long haul! Mae here’s hoping you get through that messy middle soon. I know enough about you to feel confident you will! I’m a “write because I can’t not write” writer. Money would be nice, but that’s not why I do it. If I ever run out of ideas, I’ll revisit the idea. But right now, I think I have more ideas than I have time to complete them all, and I get more daily. I’m glad you didn’t give up in the middle, Joan. I can’t wait to read book 3. I wish I could be more productive. I started 2018 hard, then life kind of got the best of me. I’d love to get back to some serious word count, but I’m afraid it will be December before I can attempt it. I have four rough outlines screaming at me, but have to work them one at a time. This has been a hard year for a lot of us. Hoping 2019 is more productive writing-wise as well as easier times. I have lots of new ideas, just need the time and to get through this WIP. Exactly, although the longer the future tales have to wait, the better they get with new thoughts. 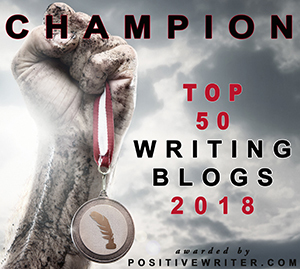 Check out this great post from Joan Hall on the Story Empire Blog with inspiration for overcoming the discouragement we often feel as writers. Yvette, you are a writer! I’m confident those voices will return. Sometimes, we need to step back and let our minds rest. When I do that, I usually come back with fresh and new ideas. Wishing you all the best, and as you say, one step at a time. A kindred spirit! Thanks, Harmony! I believe writing the short story did help. You are correct, the publishing side of indie authors is time-consuming and can be overwhelming. Spoken like a true writer!